Spanking Bethie » I got that awesome Hairbrush Paddle! I got that awesome Hairbrush Paddle! That’s right, I got it despite all the warnings! 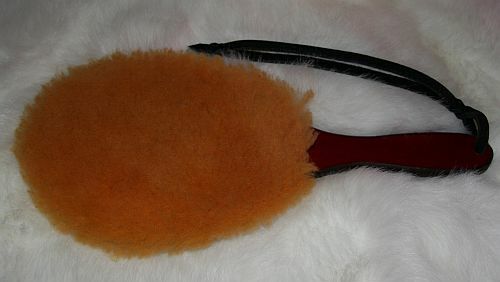 Here it is, the Hairbrush Paddle from Adam and Gillian’s Sensual Whips and Toys. I have to tell ya, it’s a real bun burner! We got the larger size which their site describes it as “Severe” and they aren’t kidding. 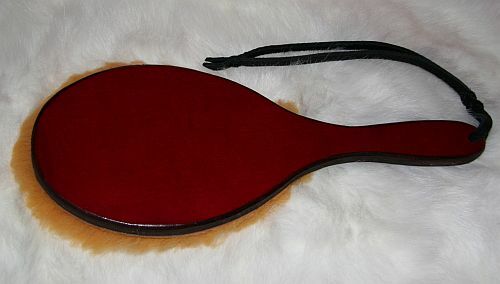 I have a pretty tough bottom but this paddle is highly effective and after a good paddling, my bottom is hot and red enough for even my color-challenged Dan to see. The spanking this paddle delivers is tough to take, but when Dan gives me a sound spanking with it, it leaves me deliciously sore so it’s worth it. It’s our favorite paddle right now. It’s got the favored spot next to his easy chair so it’s been getting a lot of use. Dan loves that it gets my attention and turns my bottom to that healthy red glow he wants to see and I love the lasting burn. I love a lasting burn, you know. What’s extra nice is that Dan had Adam and Gillian add padding to one side. It feels nice when Dan rubs it over my bottom between sets of spanks. Of course, he likes to tease me by lulling me into a false sense of security and just when I’m all relaxed and enjoying the rubbing, he’ll suddenly start spanking again. I can go from lying limply across his lap, practically purring, to suddenly squealing and kicking in just seconds. Dan keeps threatening to tie me up so he can really give me a good spanking without all the fuss but I’m not exactly on board with that idea. I like making a little fuss anyway. Just a little at least. For now, he’s keeping that paddle handy for fun. I actually think he’s using it to keep me out of his favorite chair. We have a rule that I don’t get to sit in it without asking first. It’s mainly because he’s not fond of the overstuffed chairs that I have furnished the living room with so he likes having his chair available. It’s a reasonable rule but I sometimes forget and before I know it, I find myself lounging in his big comfy chair without permission. Then I get caught. It’s funny though, Dan never seems upset that I’m in his chair. In fact, he almost seems downright gleeful about it. Hmph. Once I’m caught, he makes me bend over the chair (not nice because I like the chair) and spanks me with this paddle. Dan usually plans to give me six swats but I can’t seem to stay in position and I always end up getting more. I can’t help it! That paddle is a scorcher and by the fourth swat I’ve managed to either get out of position or I’ve wiggled myself over the side of the chair. Either way, he makes me get back in position and he starts over. I think I actually managed to get just ten swats one day. Yay for me. I’m learning though! I was just about to flop right down in his chair today when I saw that paddle on the table right next to it and I stopped in mid-flop. Then I had to debate with myself if it was worth it or not. I eventually decided to be good and moved over to another chair. Bethie, I think I mentioned that we have that paddle, although the smaller version. The thing DOES burn like the dickes, and when used for real discipline…well OUCH! I hate it. You obviously have a much braver bottom than I do! I’m back from the brink… A Spanking Good Time is back up and running. And I’m very pleased to see you are still here as usual, and having a grand old time of it, too! Your post made it possible for me to giggle with delight at the thought of Dan chasing you around with that wicked paddle! Hi Tiggs! I’m so happy to see you again! Both are quite effective, I’ve used them to great effect a couple of times. I have it on reliable authority that the two different sides feel very different. I would recommend the smaller one as a good addition to your collection if you are foolish enough to take the plunge. It is a very different (and fun) paddle. Paul, yes, the folks at Adam and Gillian’s really are nice and so easy to work with! Well all I can say is that in my opinion, the comparison is fun. Take that for what you will. Good luck with it. Hey thanks for the paddle recommendation – I ordered one just before Christmas and I’ve certainly been having a hot new year so far. Love the blog. Fab post on a fantastic-looking paddle, and just went over to the Adam/Gillians site–gonna have to pick one of these bum-toasters for my miniscule, yet slowly growing, ‘toy’ collection.